This section of ~9 kilometers uses the old high road between Creel and Divisadero to avoid the steep descent into El Cajon canyon (200 meters deep and 6 km long) taken by the paved highway. It also follows the course of a water pipeline for a substantial distance, only separating for the final portion. In contrast to Highway 77, the first part of the old road remains relatively high as it traverses this part of the Sierra offering views over the canyons in the distance. The middle part drops down to the railroad and follows stream beds in the forest, only climbing back to the ridge / mesa in the final 2.5 kms. A highlight possible from the Camino - not on the Camino itself but as a side trip - is to see the point on the railroad where the train makes a 360 degree "loop" in its climb and passes / under (depending on direction) over its own route. The Camino starts at the turnoff of the old high road ~13 kms south of Creel. The old road climbs moderately just to the left of the highway with the pine forest on its left. Another road providing access to the nearby electrical power line also climbs at 90 degree from this same point. Care to take the Camino (and not the steep road) may be necessary. The transmission line is visible through the trees (50 meters to the left) at this point, roughly parallel to the trail.. The old road is the wide, rough, rocky rural road up to 8 meters wide with no vegetation. 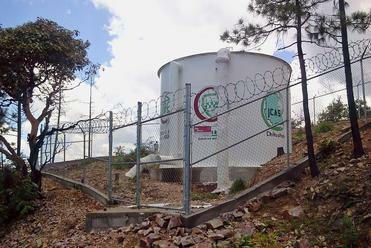 It also is the course for a water pipeline (and the pipeline itself and its related valve boxes are sometimes visible). The modern highway is visible to the right behind the trees as it drops into the Cajon canyon. (After this point the highway is not visible from the trail until the very end of this section.). The trail climbs ~40 meters in ~300 meters before leveling out. At this flattening point there is another road on the left that leads to the radio tower visible above the trail on the left. The level (very gentle ascent) section bends slowly to the right above a tree-lined bowl to a "saddle" ~1.5 kms from the start with views to the west over distant barrancas. (27.669453, 107.714405, elevation 2509 meters). This is the highest location on the Camino between Creel and this point. Past the railroad crossing the trail climbs moderately while bending to the right. Near the top of this ascent another road forks to the left. (27.654545, 107.744697, elevation 2403 meters.) The Camino, however, is the right fork that descends more steeply for 200 meters. 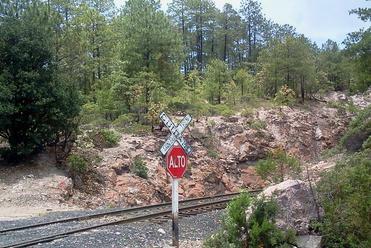 To the left on the far side of the barranca is the railroad which makes a hairpin turn in a side canyon. The trail also makes a sharp hairpin turn to the left. It descends - at first steeply, then more gently - along a stream with pine and madrone forest on both sides. 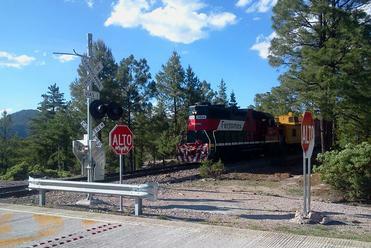 At this point the trail runs roughly parallel to the railroad on the right and ~40 meters below the railroad. 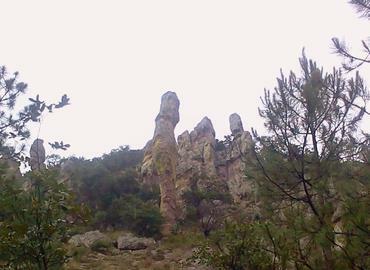 After ~1 km of pleasant hiking in this arroyo through the trees and along the stream bed, distinctive "pinnacle" type rock formations become visible along the arroyo walls on both sides of the trail. The road comes to a sharp left turn (27.653692, 107.735294, elevation 2248 meters). It begins a series of curves or switchbacks as it climbs uphill toward the railroad above. The road is rough and rocky on this ascent. The arroyo with its rock formations gradually becomes more visible from above behind the trail as it climbs. As the trail approaches very close to the tracks (after ~500 meters), the wider road (or trail) turns sharply to the right onto a narrower trail (27.651403, 107.737028, elevation 2285 meters ). Care to be sure to make this turn - that is difficult to identify - may be necessary. In ~20 meters the trail crosses the railroad tracks. (As evident later, this section of the tracks is on the lower portion of the 360 degree "loop" made by the train.). It climbs moderately through low brush on a rough surface to the top of the hill. 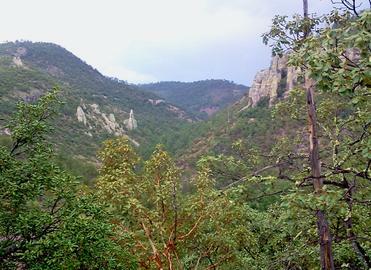 There are outstanding views of the distant Barranca del Cobre to the south from this climb section. After the section of open views, the trail enters a more vegetated section until it crosses the upper railroad tracks as it proceeds toward the crossing of the loop. 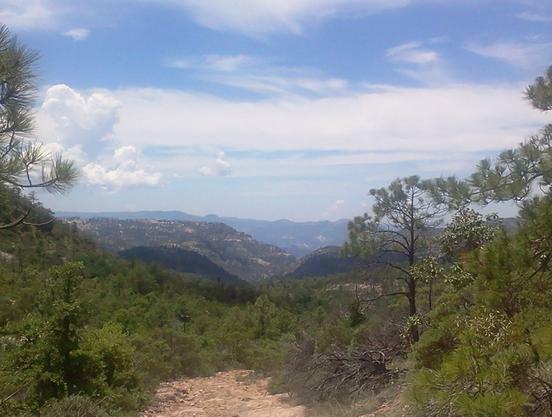 The trail flattens as it reaches the hill top in the pine forest. At the summit there is an intersection with another road turning sharply right (27.655126, 107.739437, elevation 2335 meters). At this intersection the Camino goes straight ahead. 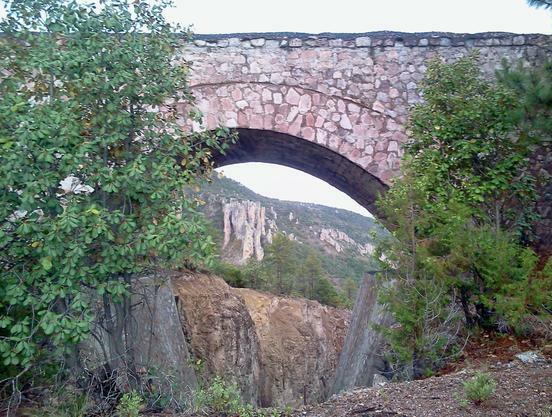 However, the right turn is a side trip to the railroad bridge where the Chepe train "crosses itself" as it climbs higher into the Sierra. Due to elevation change and limits on the climbing rate of the train, the railroad must make a 360 degree "loop" where the train actually crosses its own route. The lower portion passes through a short tunnel under the higher portion as the tracks continue upward into the Sierra. The side trip goes ~250 meters directly to the tunnel and bridge. (27.656037, 107.737357, elevation 2333 meters) It then returns to the Camino on the same path. Single green markers indicate the trail (no red markers). From the hilltop intersection the trail descends moderately on a curving path to cross the higher portion of the tracks once again. (27.654826, 107.740867, elevation 2317 meters ) There are good views to the south and west. Immediately after the upper crossing, the trail turns left and then sharply right into a hairpin. It drops moderately toward the lower tracks of the railroad visible below to the left. After ~500 meters of descent through mixed forest, the road forks with the Camino continuing on the right fork. Care to make this turn may be appropriate. The right fork road also continues descending with the tracks remaining on the left (varying distances up to 50 meters). The tracks and trails bend gradually left (southwest) for the final 500 meters of this Section 7. The trail is on rolling terrain through mixed forest and brush. This section of the trail ends as it intersects the modern Creel-Divisadero highway. This intersection occurs precisely at the crossing of the railroad and the highway. There are speed bumps of the crossing, slowing all motor vehicles as they approach the tracks. There is a large open area on the southwest side (across from the end of the Section 7 trail). This clear area is ~20 kms from Creel. It may be a suitable area for hikers to use buses for access.